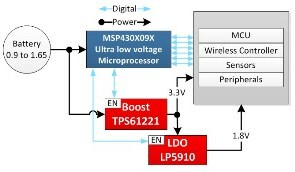 The MSP430X09X can operate form ultra-low voltages (ULV) in the range of 0.9V to 1.65V; however most of the devices in the system requires higher voltages. 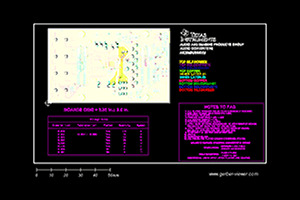 TIDA-00599 provides a solution for those companion devices that requires 1.8V and 3.3V input voltages. A 3.3V voltage rail is generated from a 0.9V to 1.65 V batteries using the TPS61221 boost converter and a 1.8V voltage rail is generated using a high PSRR LDO (LP5910) connected in series with the boost converter output voltage rail. The combine output current is 100 mA at 1.65V input voltage and 50 mA at 0.90 V input voltage. 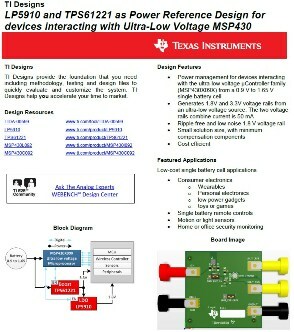 This power solution is deal to power sensors and peripherals from the same ultra-low voltage source powering the MSP430 family line.